For grass-based ranches, this year’s ideal weather has meant lots of forage, and plump, happy animals. While a time of dormancy for some farms, winter can yield new life on the ranch. 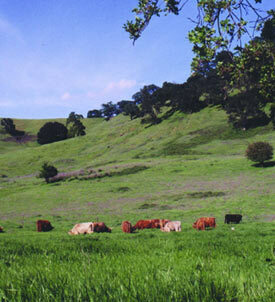 At Highland Hills Farm, located West of Vacaville at the southern end of Pleasants Valley, pastures are unusually green this winter. Early October rains meant that grasses on rancher Ted Fuller’s 130 acres of hill range germinated when the sun was still strong, and are unusually mature for this point in the season. As the mixture of annuals and perennials grow, Ted monitors the grasses’ nutritional value by observing color, density, and texture. 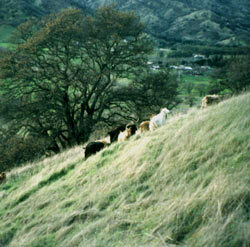 When the forage is sufficiently developed, Highland cattle, Toggenburg and Cashmere goats, and Icelandic and Dorset sheep are transitioned into the hills from the low-lying irrigated pastures on which they graze during the spring, summer and most of autumn. A seasonal creek that cuts through Highland Hills Farm is flowing steadily and a natural spring at the base of the hills is quickly filling with water, eliminating the need to fill troughs. Liberated from the dry-weather chore of irrigation since the rains began, Ted concentrates on growing and maintaining his herds. In mid-December, bulls were taken from a separate pasture and placed together with cows to breed. Those cows will calve next autumn after a nine-month gestation period. Cows that were bred last spring are now in their third trimester and are closely watched as they may need supplemental nutrition such as grass hay. The breeding opportunities of cattle must be managed so that calves are not born in the summer when the weather is too warm for their small bodies to regulate temperature well. In the next few months, approximately 35 calves will be born on the farm. Meanwhile, ewes who have lambed and does who have kidded are brought onto areas of pasture where predator-proof fences protect the young from coyotes. Coyotes are a constant problem at the ranch and especially so at this time of the year. Just as the sheep and goats are birthing, coyotes are also getting ready to bear their young. Higher nutritional needs of the coyotes during pregnancy and nursing means greater risk of losing a lamb or kid. Ted is also staying attentive to the body condition of his cattle. While bulls and cows should be maintaining their weights, steers should currently be gaining at least one or two pounds per day with such abundance in the fields. In the spring, they can gain as many as three pounds per day. This increase in their size is extremely important because the finished weight of the cattle translates directly into income for the farm. Although Ted is taking the month of January off from selling at the farmers market, he will be plenty busy. To have product ready on February 5th when he returns to the market, animals will have to be sent to slaughter by January 12th so the meat can dry-age at the butchers for at least 21 days before it is cut. He will also be checking and repairing fences on the farm and looking for new land to purchase. After five years in its current location, Highland Hills Farm is outgrowing the available area and will to move to a larger piece of land towards the coast within the next year. Highland Hills Farm will be at our holiday farmers market on December 24th with premium steaks, roasts, and leg of lamb.